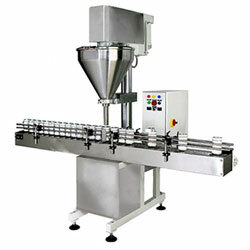 We are the chief manufacturer and supplier of wide-ranging Auger Filling Machines in India. Auger Filling Machine is widely used in the food, cosmetic, pharmaceutical and confectionery industries to fill diverse types of substances like granules, semi liquid, very viscous materials, etc. They offer a precise filling of the material as well as high productivity because of their hi-tech auger screw, clutch brake as well as micro-processor control system. Match up to the huge market demands; we are involved in offering the best quality of these Machines. These Auger filling Machines are robust in construction and have a longer working life. Moreover, we are expert in providing the best quality of products at most affordable rates to our consumers. This machine is specially designed for an effortless and world-class experience of filling. 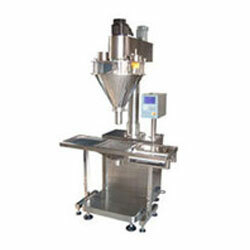 Even the higher weight filling capacity is made suitable for filling and packing of a variety of products. These machines are extensively known for its higher productivity and capability of offering best quality of output. We provide the highest quality materials & components procured from the most reliable vendors of the market. These are designed and made as per the international norms of quality and are based on the modern technology. We also customize them in diverse specifications as per the application requirements laid down by our customers. Filling Range 0.5 gm. to 1000 gm. Speed 6-25 fills per minute. Packing Material Pouch, Jar, Bottle. Turret Drive Electric Motor 0.75 H.P / 415 V / 1400 RPM.